To make things a bit easier I’ll explain my daily routine at the school as a North American Language and Culture Assistant. I teach to almost all of the students in this school which consists of grades 1 through 6. Class sizes are fairly small, between 12-18, so not too overwhelming if you’re nervous about getting in front of the class for the first time. At the start of the ConversaSpain program, I was assigned to three different schools with my 15 hours spread out between them. All of my schools are in the same area; on the bus, it takes me around half an hour to get to school from Murcia. For the most part of my classes I’m just an English assistant, however, with grades 3 and 4 I get to do Science. Most of the classes start off the same way. We talk about the date, the weather, and the season. Obviously, this is pretty repetitive but it helps the students get ready to start thinking in English. You can see me in the English corner with one of the students, with pictures and keywords to guide the students. I will ask “What day is it today?”, “What day is it tomorrow?”, “What’s the weather like? We move on to greetings. “Good Morning” “How are you today?” To which they will always reply “I’m fine, thanks, and you?”. However, as we get into the older grades, we’re trying to steer away from that automatic response so we’ll take a few extra minutes to go around the class and if the students feel like sharing, they will try their best to explain how they feel, and why they feel that way. Depending on how the kids are responding I could go on with different questions and commands for 15-20 minutes, reviewing some of the material we learned in the last lesson. What Kind of Games Can a Cultural Ambassador in Spain Use? Conversation Assistants don’t have to plan the lessons always, but schools need and appreciate initiative and suggestions. I made an easy “Guess Who?” game for the students in my Deepening of English class. They loved it, and now if we ever have an extra few minutes at the end of the class, we will play it. As you can see in the picture, we play BINGO with our new unit key words. There are usually 10 keywords and to help the kids get to know them, we use BINGO quite often. The kids will then bring their paper up to me at the front of the class to check for spelling errors. I have recently gotten the students to read me the four keywords out loud, in this way I include some extra speaking practice in. There are no prizes but they get to move up their name tag in the BINGO section and they love it as much as they love a prize. Is better that Auxiliares de conversación don’t speak Spanish in the classroom at all, so the kids are forced to practice their English with you. If they are struggling to understand the assignment, I do my best to help them by pointing to pictures in the textbook or annunciating specific keywords to get them on the right track. Science classes prove to be a bit more challenging since the last time I studied the different systems in our body was when I learnt them for the first time 15 years ago. The teacher will usually take over the first half of the class and I’ll do the assignment with the students at the end of the class. Then for the next class, we’ll switch it up, and if I feel comfortable enough, I’ll start the class off. 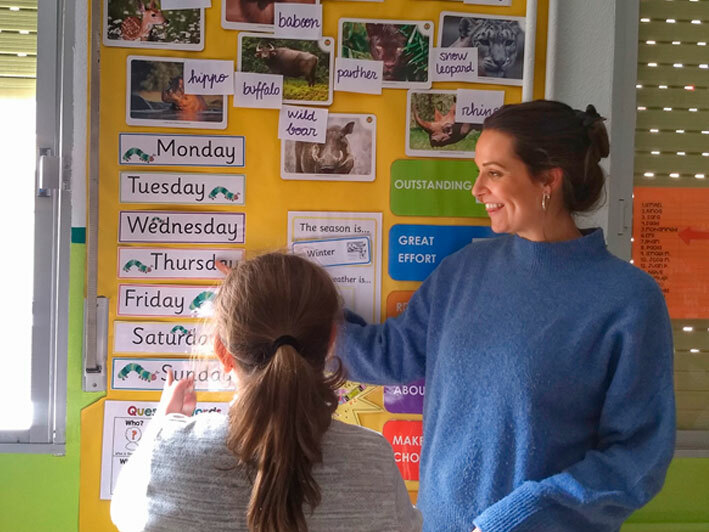 The teacher is always in the room and watching to see if the students are grasping the concepts or need a bit more of an explanation in Spanish. What Can an English Assistant Do with Shy Kids? Most kids are quite shy when speaking because they don’t want to make mistakes so helping them build their confidence is very important. I try not to correct every mistake they make because I don’t want them to get discouraged, but the ones that are used often in everyday conversation should be fixed before it becomes a habit. I always make an effort to speak clearly and repeat what I say so they have a chance to grasp what I am saying. If I ask a question and don’t get a response, I’ll word it in a different way until they understand what is being asked. All in all, being a Conversation Assistant is a low-stress job with lots of rewards. I am learning so much about different teaching styles, learning styles and what it is to be a teacher without really having to take too much control. If you’re looking to get out of your comfort zone and live something new, I recommend you this experience. All that without even getting to talk about how great it is to live in Spain. 5 responses on "The Role of a North American Language and Culture Assistant with ConversaSpain"
Great summary of “a day in the life.” I especially like how you use warmers to get the students ready for learning! We really do have a fantastic job! I love being a language assistant. I completely understand what you mean about the shy students! What I usually try to do is to encourage them by letting them know that they don’t have to worry about getting it wrong and the important thing is to just try. I let them know that I am there to help them not judge them.